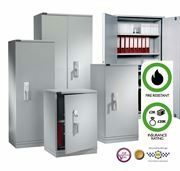 Hazardous substance storage cupboards provide a secure facility for materials which are required to be stored when not in use. Supplied with appropriate safety labelling, the highly visible yellow colour also ensures awareness of the potential danger of the materials stored and makes location easy. Hazardous cupboards are manufactured throughout from steel, available in full or half height. 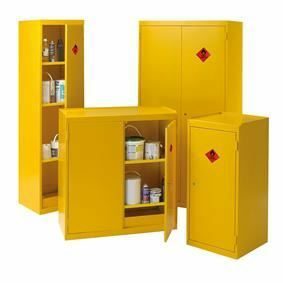 The secure storage cupboards are epoxy powder coated in RAL 1003 yellow, supplied with safety labelling accordance with BS 5378 perforated adjustable shelves allow drainage to the sump which has handles for easy removal. FREE Standard delivery to UK mainland is included in the price of these cabinets. Conditions apply, see specification tab below for full details. To qualify for the free UK delivery option, cabinets must be ordered separately without any other items from our range. Our online UK mainland shipping option excludes Scotland and the following postcodes; DT, EX, PL, TA, TQ, TR, if you require delivery to one of these areas please complete your order for a delivery quote, no payment will be taken. One person delivery is transported to your first, ground-floor, entrance - or kerb side, if access is restricted by steps or other obstacles. If delivery is required further than this point it is necessary to contact us with full details for a quotation. 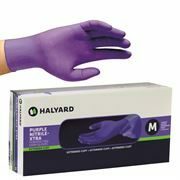 We will advise an expected delivery by date on receipt of order. 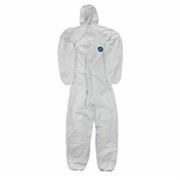 The delivery window will be approximately 4 working days up to and including the date specified. We can arrange for deliveries to be made on a specific day or at a specific time, however this will incur additional delivery charges, please contact our office for confirmation.